That this museum has a '57 Caddy convertible is cool enough. 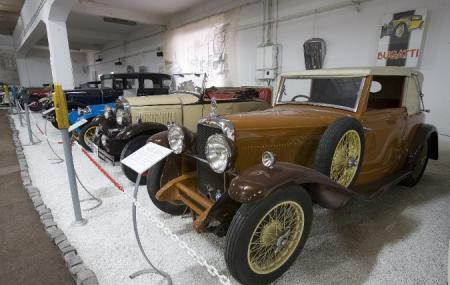 That the car only had one previous owner – President Tito – is what tells you that this museum is very serious about it’s collection. The collection isn’t very large, but it’s intimate, and it’s important. You’ll see a few powerful bikes; Ferrari, Cadillac, Porsche, Ford, Opel are all represented here; and the oldest car here is a French wooden tricycle from 1897. Altogether there are about 50 cars in this collection. How popular is Automobile Museum? People normally club together Ptt Museum and Terazije Square And Fountain while planning their visit to Automobile Museum. Place for automotive world enthusiast! History at hand, with variety of iconic models worth fortune... A bit of more info and professional naration is needed and if you're lucky, owner is somewhere around to share some storytelling. For me, it was mega! A worthy visit. This amazing private collection of automitive milestone models from the 18-hundreds up to 1960s is definitely worth a visit! Reserve one hour and hope for a chance to talk to the owner who is a great storyteller and knows every single detail of each single exhibit. It is a pity that some of the information he conveyed is not written up in a brochure. Great small museum with good variety of car collection, some motorcycles and some technical stuff. If you are in Belgrad, visit it, its very cute. Lots of cars in excellent condition and participate in historic rally. P.s cards not accepted unfortunately. Small and cozy place, a lot of cool old cars to see.